This entry was posted on August 1, 2018 by piranha. August is a time for bringing all the fun, flavour and vibrant colour of the carnival atmosphere to the UK. Last year around 2 million people attended Notting Hill Carnival in London, making it Europe’s biggest street festival. The carnival is now part of the capital’s varied multicultural past and present. The annual event is a thrilling spectacle that has taken place since 1966 in the Royal Borough of Kensington and Chelsea over the August bank holiday weekend. Further up the UK in Manchester, the smaller Windrush Bacchanal Caribbean Carnival in Manchester is the north west’s largest celebration of Caribbean music and carnival arts and has been bringing the steel drums, feathers and costumes for party lovers to enjoy for 40 years now. Food stalls at both the carnivals are as vital part of the experience as the calypso music, Caribbean punch, and mas troupe dancing. So, if you’re visiting any of the carnivals this year, make sure you go with a smile on your face and some cash in your pocket and enjoy some authentic West Indian food. And, even if you can’t get to one of the big regional carnival events, why not bring the carnival spirit closer to home? The Cinders StreetWok combines a low-pressure quiet flame with a powerful heat output in a portable appliance that lets you spice up your customers’ summer by bringing a little bit of Kingston, Bridgetown or Port of Spain to a carnival-inspired event near you. In a food processor or blender, combine the spring onions, onion, chilli, soy sauce, vinegar, vegetable oil, brown sugar, thyme, cloves, nutmeg and allspice. Mix for about 15 seconds. Place the chicken in a medium bowl and coat with the marinade. Refrigerate for 4 to 6 hours, or overnight. Preheat barbecue for high heat. Lightly oil barbecue. 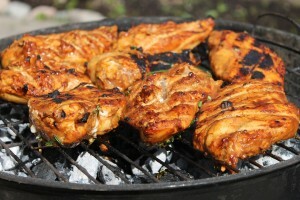 Cook chicken on the prepared barbecue 6 to 8 minutes, until juices run clear. Serve with mac’n cheese, molasses beans, coleslaw and potato salad washed down with an ice cold Caribbean beer and make it a date to remember. Make sure that you bring Jamaica, Trinidad or Barbados and your very own carnival atmosphere to your outdoor venue.